NYU Candlelight Vigil for Virginia Tech. 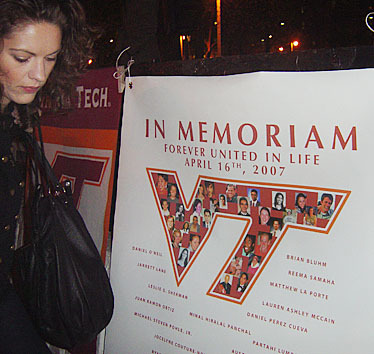 APRIL 19, 2007: Washington Square, NYC: Hundreds of New York University students, faculty and residents of the West Village convene on Washington Square Park to honor the memory of the innocent lives lost at Virginia Tech. 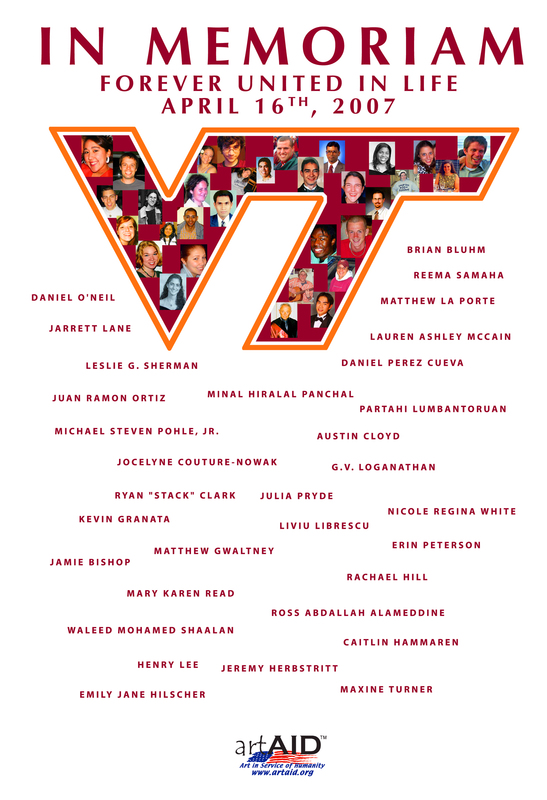 ArtAID produced a remarkable Memorial banner for the event, featuring the names and faces of all 32 victims. For a closer look at the faces, ArtAID has compiled an online Memorial page In Memoriam: United in Life. Further information can be found on the Virginia Tech Student paper homepage: www.collegemedia.com. Students gather in the Kimmel Center's stairwell to offer prayer for those killed at Virginia Tech University and their families. Washington Square Park also hosted a candlelight vigil. About 400 NYU students, Virginia Tech University alumni and community members surrounded the elevated platform in Washington Square Park last night for a candlelight vigil honoring the 32 Virginia Tech students and faculty members who were killed in Monday's shooting spree. At 7:30, mourners - the majority of whom were Virginia Tech alumni bundled up in orange sweatshirts and maroon scarves - began to gather. Many got up and shared their memories of life at Virginia Tech. Speakers from the podium would also intermittently yell, "Go!" and the crowd responded, "Hokies!" Earlier at 5 p.m., more than 200 students crammed onto the grand staircase and the second-floor balcony of the Kimmel Center for a time of prayer and reflection. Catholic, Protestant, Jewish and Muslim leaders prayed for the victims and their families, saying that the NYU community, with the Sept. 11 World Trade Center attacks fresh in its memories, shares in their grief. At the vigil, white ribbons were passed out to symbolize NYU's solidarity with Virginia Tech. After addressing the crowd, Rabbi Yehuda Sarna said the turnout was a symbol of the connection NYU students feel with the Virginia Tech community - a connection that he said relates "student to student, classroom to classroom, heart to heart." Wagner graduate student Shital Shah said people gathered because this shooting affects everyone on the "level of humanity." "It could have been our school and any one of us," Shah said. Steinhardt sophomore Tiffany Chang, whose boyfriend attends Virginia Tech, is holding a fund-raising event today at Palladium residence hall to deliver care packages to Virginia Tech students within the next few days. The organizers of the candlelight vigil, Gallatin seniors Nicole Vengrove and Lindsay Katona, were part of the delegation the Bronfman Center sent to Virginia Tech the day after the shootings. They attended the convocation ceremony and the vigil held on Virginia Tech's main campus on Tuesday. "There's a lot you can do from afar," Sarna said. "But it doesn't compare with being there." For Vengrove, going to Virginia was about making a personal connection and bringing it back - "We have to respond as people," she said. "We have to take it upon ourselves." Both Vengrove and Katona were pleasantly surprised by the number of people who attended the vigil. "Our biggest fear coming back was that there would be nothing to come back to," Katona said. CAS senior Lee Hagy, who was waitlisted at Virginia Tech, said he observed support from the NYU community and students all over the world who left messages of support via Facebook. "I'm heartbroken," Hagy said. "My friend, Heather, lost her three friends. She said there's been such an outpouring [of sympathy]. ... I was really glad NYU did a lot - New York can empathize with pain." This Artwork is available for free download for personal use. Commercial use is prohibited by law without permission.